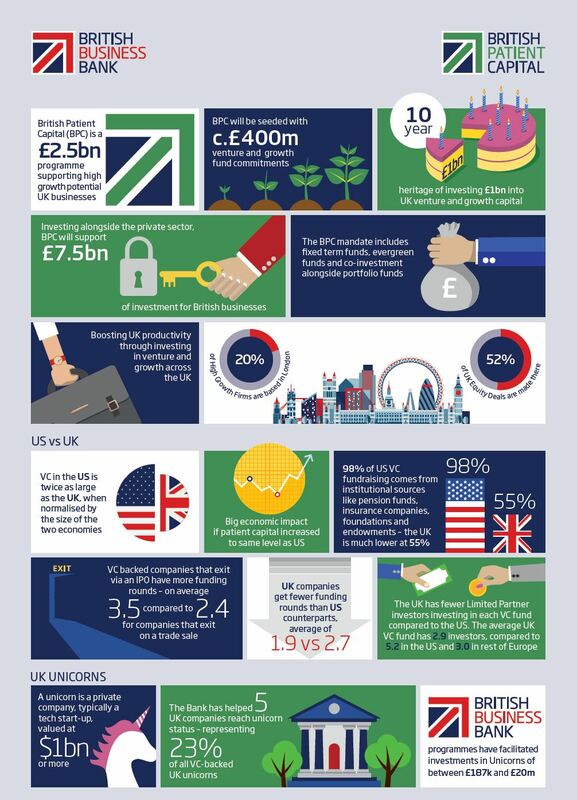 The British Business Bank is launching British Patient Capital, a new £2.5bn programme designed to enable long-term investment in high growth potential companies across the UK led by ambitious entrepreneurs who want to build successful, world-class businesses. The creation of the £2.5bn programme is one of the key outcomes of the Patient Capital Review. Announced by the Chancellor at Autumn Budget 2017, the programme is an important element of the Government’s Industrial Strategy. It will support UK businesses with high growth potential to access the long-term financing they need to scale up. By investing alongside the private sector, British Patient Capital will support a total of £7.5bn of investment for British businesses. British Patient Capital will be developed as a separate subsidiary of the British Business Bank with a view to future sale into the private sector with an established portfolio and proven track record. A £30m cornerstone investment in venture capital firm Draper Esprit’s £115m capital raise. This will be the programme’s first evergreen investment, expanding the market for long-term investment in the UK. Completion of this investment is subject to Draper Esprit shareholder approval. A £9m investment in the Dementia Discovery Fund, a specialist, 15-year life venture capital fund that invests in novel science to create meaningful new medicines for dementia. The fund benefits from a diverse range of strategic investors including charity, pharma, public and significant private investors. The British Business Bank has significant experience as both an institutional investor and supporting a diverse patient capital market. Its Enterprise Capital Funds (ECF) programme has an investment capacity of £1.1bn of funds and helped grow several start-up funds into major names in the venture capital market. The Bank’s Chief Executive Keith Morgan has been appointed as the Chairman of British Patient Capital. Anne Glover CBE, CEO and co-founder of Amadeus Capital Partners Limited joins British Patient Capital as a Non-Executive Director today. Anne has recently been appointed a Non-Executive Director to Court of the Bank of England. Anne was a founder of Calderstone Capital Ltd, and was Chief Operating Officer of Virtuality Group plc. She is a Member of both the Council for Science and Technology, and a former Chairman of the BVCA and Invest Europe. Russ Cummings, former CEO, Touchstone Innovations plc, one of the UK’s leading technology investment companies, championing outstanding science by commercialising innovative research from UK universities, joins British Patient Capital as a Non-Executive Director. Russ brings more than 25 years’ experience as a venture capital and private equity investor having worked for Scottish Equity Partners LLP and 3i Group plc. Existing proposals that qualify under the existing Venture Capital Catalyst programme will now be processed under the British Patient Capital programme.